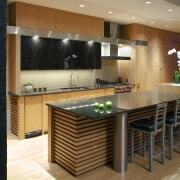 View of contemporary kitchen with wooden features and black stools. Modern, clean-lined kitchens are frequently the order of the day but they can present as being rather cold and clinical. 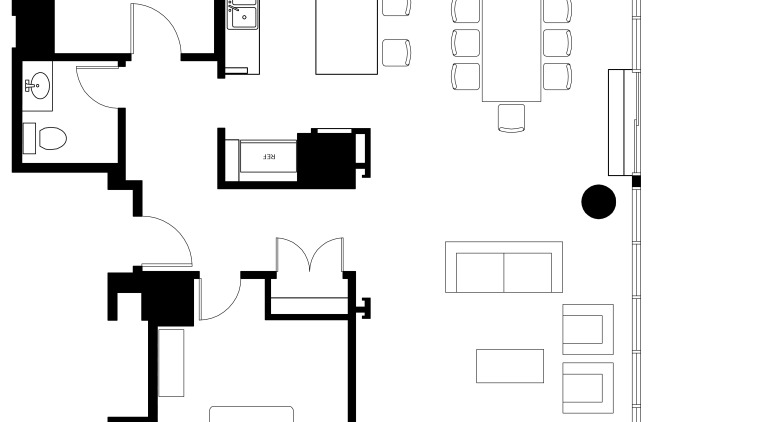 An astute design will combine a love of straight lines and planes with a more approachable, comfortable accent. 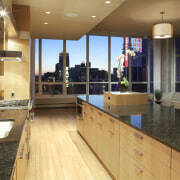 Architect Tim Bjella was asked to design this loft kitchen following on from an earlier project with the same clients. While the previous job had involved a traditional look, this time the owners wanted a contemporary feel, more in keeping with the loft environment, says Bjella. "However, at the same time they wanted the kitchen to have a warm, welcoming appeal, so in line with this I introduced an Asian influence, where the look is angular and minimal, but tone and texture bring out the sense of warmth." 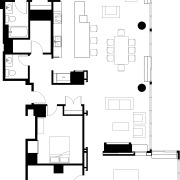 The loft was bought by the owners under the condition that the floors in the remodeled space would be replaced. 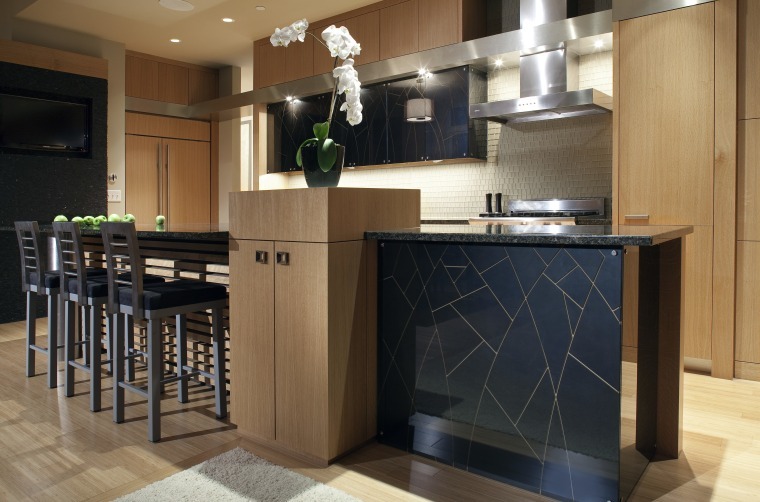 In response, Bjella selected sustainable, warm-toned bamboo for the flooring and this led the overall design. 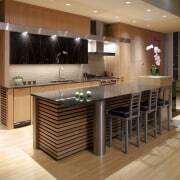 "I chose stained quarter-sawn white oak for the cabinetry a close match to the bamboo floors. This cut of wood can create a busy, Cathedral look for the grain, but with white oak the result is a straighter, more subtle effect." 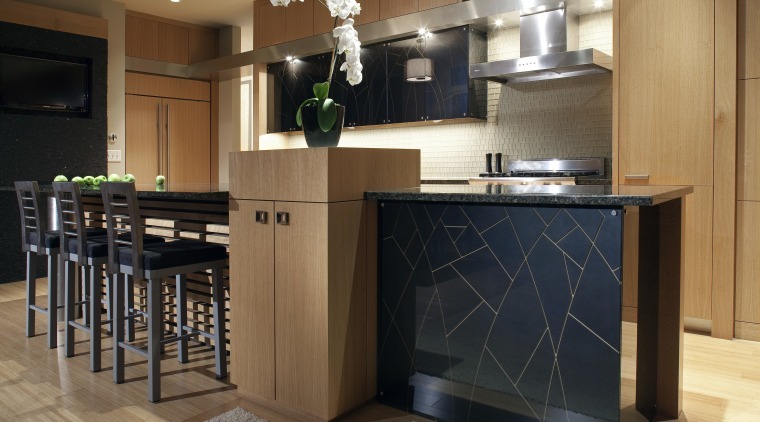 "To bring in a more Asian-like interest I designed a slightly abstracted patterning for the end of the island and the rear cabinetry. This depicts forest twigs and leaves, appropriate to the locality's harsh winters and deciduous trees it also calls to mind Japanese cherry blossom." 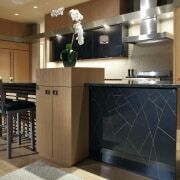 The surface was created by staining MDF black and routing the pattern onto this finally a gray smoked glass covers the cabinet surface, softening the overall effect. In balance with these elements, there is a wall of tiny black stone tiles on the other side of the kitchen. The black stone and twig pattern are carried through in other areas of the home. While dark and light combine in a Yin-Yang balance, so too does the interplay of vertical and horizontal lines. Tucked under a 9ft-high dropped ceiling living areas are 12ft high the kitchen features a solid stainless steel band that further lowers the height in visual terms and adds to its approachability and warmth. The band continues to the left as a floating shelf and to the right it changes to a long cabinet panel signifying the move beyond the central kitchen. "The slatwork on the front of the island builds on the horizontal emphasis and is also reminiscent of a Japanese shoji screen. The wood's natural warmth is augmented by the textural appeal of the slatwork," says Bjella. "In contrast to this, I designed a feature stainless steel support for the cantilevered countertop to the left of the island. 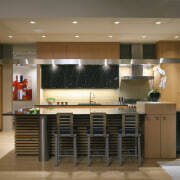 A box-like cabinet to the right of the seating area adds to the vertical emphasis, as does the grain of the cabinetry." The vertical cabinet fulfills another role in the design. Bjella did not want the front of the island to present as a long row of bar seating which would have brought a colder aesthetic. Instead, the cabinet breaks up this flow, and beyond it the countertop has a much smaller overhang than in the seating area of the island. "The kitchen is as driven by function as it is by aesthetic impact," says the architect. "To the right of the cooktop is a capacious pantry. A plethora of appliances are integrated into the cabinetry and storage is tucked on the inner side of the island and above the metal banding. In addition, work triangles are tight and the pale wood is easy to maintain."